There are still lots of PCs out there that would take on new life with a simple hard-drive-to-SSD upgrade, and Sandisk’s Ultra 3D is one of the best, if not the best SSD for the job. Using the same 3D (stacked, or layered) TLC NAND found in the WD Blue 3D SSD we also tested (WD owns Sandisk) it offers the capacity of TLC without the write performance penalties we’ve experienced previously. Though most users will only see the Ultra 3D when installing it in a computer, we should note that the Ultra 3D is a notch above the average drive in appearance—black, with a classy red logo. If you’re filling out the storage on a gaming rig with clear panels, that could be a consideration. The Ultra 3D is available in 250GB, 500GB, 1TB (the size we tested), and 2TB capacities, which we saw online for about $100, $165, $285, and $550 respectively. That’s around 25 cents per GB in the highest capacity. The 250GB model is rated for 100TBW (TeraBytes Written) over the lifetime of the drive, the 500GB model for 200TBW, the 1TB version for 400TBW, and the 2TB version for 500TBW. We’re not sure why the TBW rating for the largest capacity would drop from 40 percent per GB to 25 percent. Perhaps it’s not over-provisioned as heartily—in other words, there’s not as much extra NAND on board to replace worn-out cells. All capacities are covered by a 3-year warranty. The Ultra 3D’s good performance is notable for not suffering the write performance penalty you see when similarly priced TLC NAND-based drives run out of cache. WD/Sandisk claims this is due to a more multi-tiered caching technique combining TLC and TLC treated as SLC. That’s what everyone else does, but apparently WD is either better at it, or uses more cache. We threw an extra 320GB data set at it to make sure it could sustain the pace. It did. We test using AS SSD and CrystalDiskMark, then back that up with real-world copying of a single large 20GB file, as well as a 20GB mix of smaller files and folders. As you can see below, there’s not a whole lot of difference between the Ultra 3D’s performance and that of MLC drives. 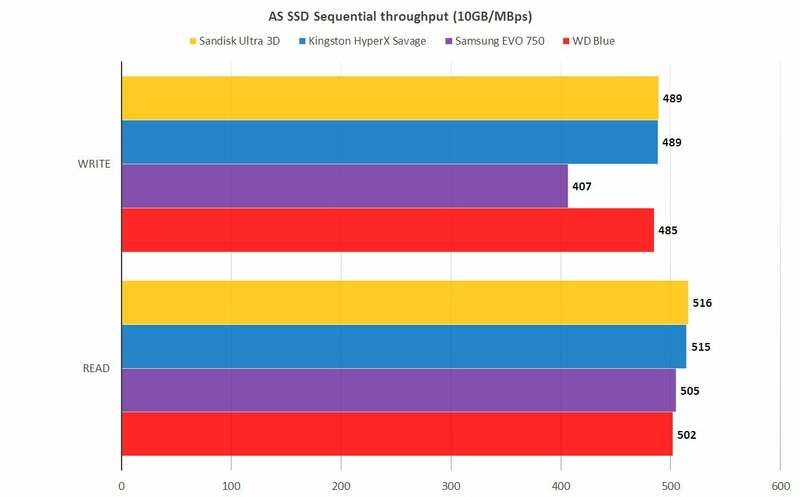 Note the lack of a dropout in the AS SSD 10GB write test, where the Samsung EVO series and other TLC drives suffer. 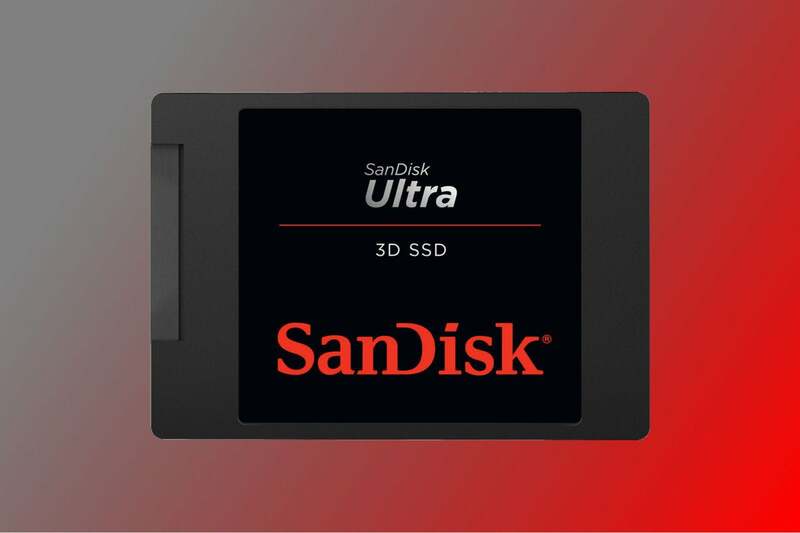 The Sandisk Ultra 3D is faster overall than any other TLC drive we’ve tested. The Ultra 3D didn’t write our 20GB mix of files and folders as quickly as we’d hoped, but it’s still a good performer overall. And certainly faster writing than the Samsung EVO series. 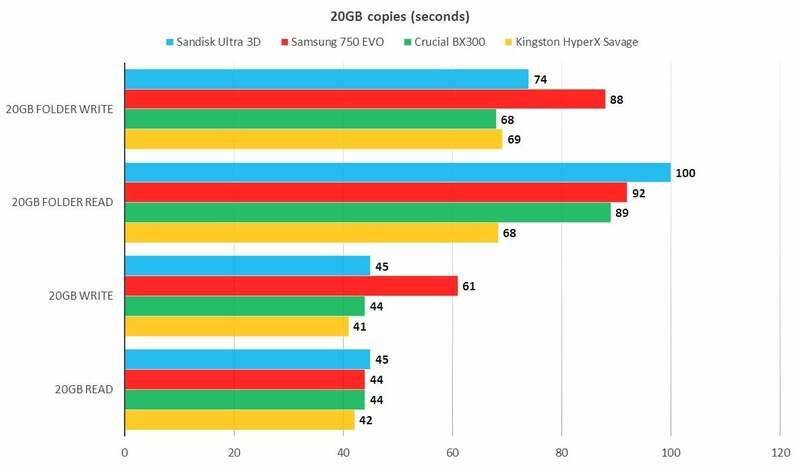 For some reason, as you can see in the chart above, the Ultra 3D didn’t fare all that well reading our 20GB mix of files and folders, but overall, it’s still a better performer than the Samsung 750 EVO. And it’s certainly ballpark in most respects with the average MLC NAND SSD. 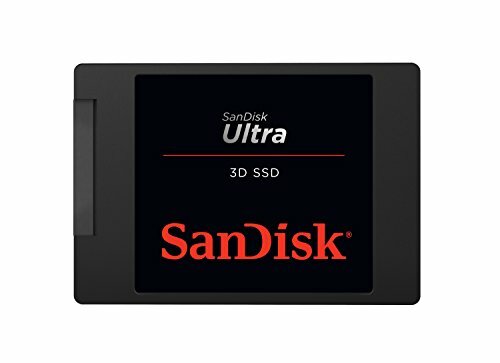 The Sandisk Ultra 3D doesn’t displace the Crucial BX300 as our current top choice among bargain or mid-range SSDs, unless you need more than that drive’s 480GB maximum capacity. Then it’s the Ultra 3D for sure, even over the Samsung 750 EVO. Fast, affordable, good-looking, a nice TBW rating... What’s not to like? Note: This article was edited to reflect new testing with a 320GB data set rather than the 80GB data set used originally.